As a groom, you’re not just worrying about your own outfit. You also have to worry about what your groomsmen are going to wear. They are your squad, and this is your wedding day. On this day like no other, your squad has got to look tight. 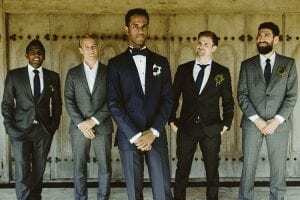 You may be thinking “My groomsmen should be able to dress themselves by now. They are groomsmen after all.” But if you want them to hit certain sartorial goals, then you may have to step in. Looking like an entourage and not a rabble will require some degree of coordination. They have to be organized, and they have to match. Whatever you want your groomsmen to wear, be sensitive to the financial ramifications. Not everybody earns the same as you. You could go HAM and provide your groomsmen with suits. But how practical is that, really? Even if you opt for affordable off-the-rack suits, they’ll still need to be tailored, and that’s going to add up. Besides, it’s possible to get your groomsmen on point without forcing them to wear the exact same thing. You could tell them they have to wear tuxedos, for instance: even though they won’t be identical, they’ll still be fairly uniform. Same with navy blue suits: the most common color, along with grey, but likely to throw up fewer perceptibly different shades. There’s a decent chance that they already own a blue suit, and the few that don’t will object far less to buying one, as it’s a standard item that will get lots of use. Plus, you’ve given them leeway to find an option within their budget. If they still don’t want to shell out, you could rent them some duds using the money you’ve saved on dressing your whole squad. For even more flexibility still, you could implement a foolproof color scheme — e.g. “blue and brown” — and let them riff on that. Don’t specify more than three colors though, otherwise the effect will be diluted. Even the most ragtag group can become a recognisable collective with the addition of synchronised accessories, such as matching ties and pocket squares. This strategy is also cheaper than buying entire suits, which will help your less well-off groomsmen. A power-tip to consider when going this route: ties and pocket squares should be similar, but not exactly the same pattern. An exact match feels cheap, like a polyester set you would wear to your prom. A boutonnière can also be remarkably effective at demarcating your crew, particularly amid the murkiness of black tie. Your guests are unlikely to roll up with lapel flowers, after all. Boutonnières can also tie your squad into the overall wedding scheme without anyone having to resort to coloured neckwear and cummerbunds. Weirdly, there seems to be something of a trend for groomsmen wearing matching suspenders, which doesn’t seem to make a whole lot of sense, unless you plan on keeping your jackets off the entire time and performing as a Mumford & Sons tribute act at the reception. Also: who’ll have use for suspenders once the wedding is over? 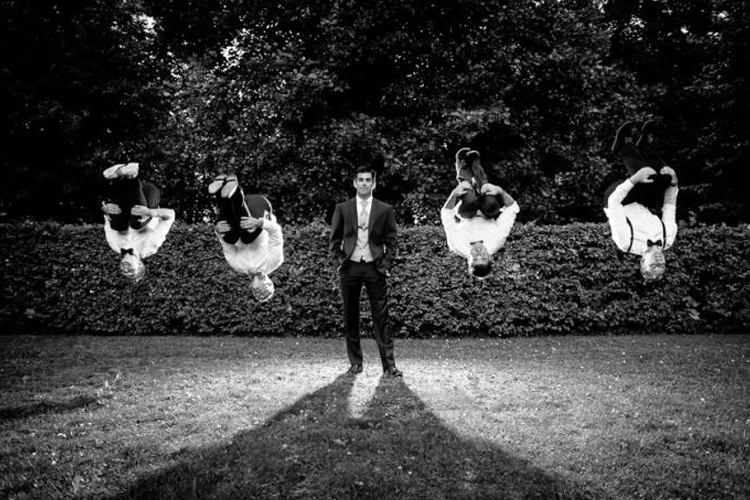 Basically, you want your groomsmen to stand out without everyone donning the same uniform. As Vogue editrice Anna Wintour so witheringly put it, you don’t want to be too “matchy-matchy”. It’s not enough for the groomsmen to look like they belong to a team, they have to feel like they belong to a team as well. You can build that team spirit by gifting them with accessories, as above, or with special matching groomsmen gifts. But experiences — tickets to a game, a dinner — can be treasured more than a trinket that will sit in a drawer, gathering dust. We know of one groom who, on the morning of his wedding, took his boys out for a slap-up breakfast at a favourite brunch spot, which was even more special given that most of them were wearing tuxes. Another arranged optional haircuts, wet shaves and beers at his barber’s the night before, which was a nice excuse to hang out with his buds, while also ensuring that his groomsmen were actually groomed. Of course, it’s not enough that your groomsmen merely look good, or cohesive. You want them to look better than everybody else. One way is to give your guests one dress code and your groomsmen another, swaggier one: e.g. cocktail for guests, black tie for groomsmen (they pull a knife, you pull a gun.) 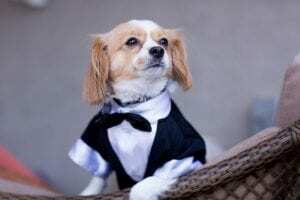 It sounds Machiavellian and underhanded, but it doesn’t have to be: you could chose black tie optional for your wedding, in the expectation that your groomsmen will make the effort but most of my guests probably wouldn’t. 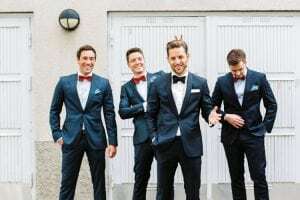 Alternatively, you can give your guests a strict dress code — like black tie — that your groomsmen then augment with coloured tuxes (midnight blue, for instance, is a subtle standout) or accessories. If your guests are wearing normal suits, then a lighter blue or grey will elevate your groomsmen above the navy and charcoal crowd. Colour isn’t the only variable either: most suits are made of shiny worsted wool, so a textured fabric such as flannel, tweed or linen contrasts strikingly. The problem then is that you’re back to coughing up for specific suits. 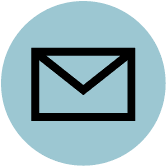 But you can use the same principle by wearing matte-finish ties and pocket squares instead of glossy silk, or a linen or chambray shirt in place of everyday cotton poplin. 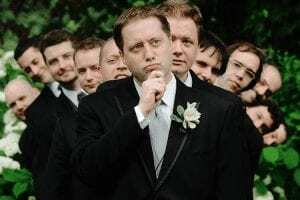 Last but not least, having attired your groomsmen like complete bosses, you need to make sure that you’re unmistakably the boss, the capo di tutti capi. This shouldn’t be too difficult, given that you’re dictating what they wear. Simply flex all over them by levelling up your color, fabric or silhouette. If they’re in black tie, then you see them and raise them with a coloured tux, a double breasted or a shawl lapel. 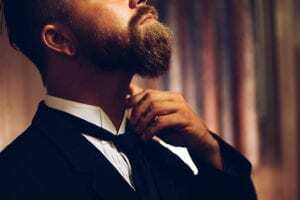 Or, if you really want to be the alpha male, all of the above: for one wedding we recently attended, the groom wore a triple-threat double-breasted tux made of a matte mid-grey cashmere (by Brunello Cucinelli, in case you’re wondering. This guy worked in fashion). Overkill? Maybe. But at least he was in no danger of being upstaged by his groomsmen. 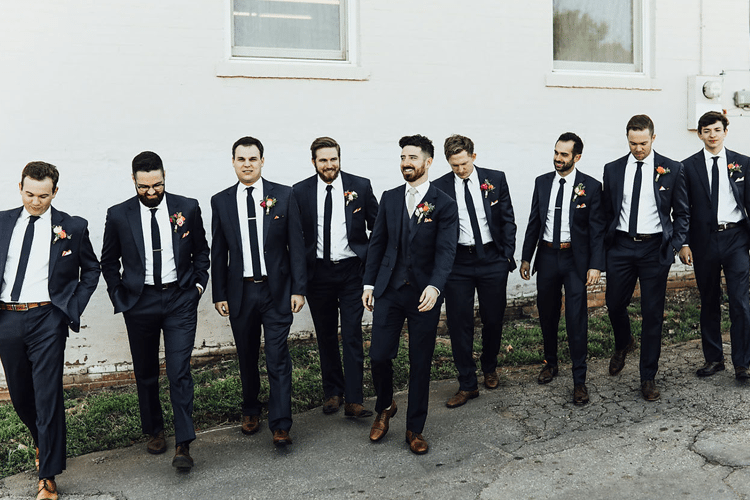 When it comes to your groomsmen’s outfits, help them come up with a smart style that doesn’t look like a uniform and doesn’t make you look like a stooge.